The St. Louis Rams opened free agency adding a big target for Sam Bradford. 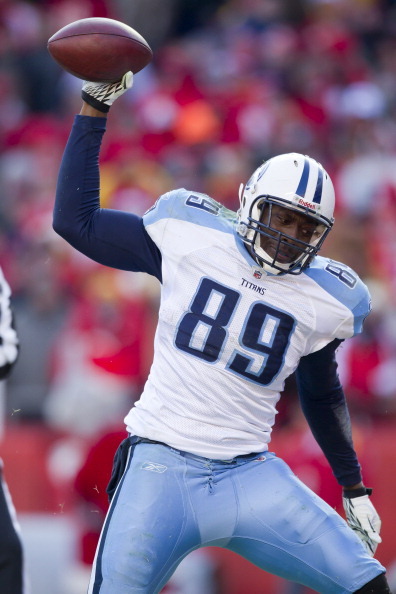 Though not Percy Harvin or Anquan Boldin, the Rams signed former Tennessee Titan Jared Cook to a 5-year deal worth $35 million with $19 million guaranteed. What seems like a boatload of money for a tight end with eight career touchdown receptions is actually considered fair compensation in today’s frenzy. Keep in mind the Chiefs paid Chase Daniel $10 million despite having thrown nine regular season passes. You find me a free agent that’s not overpaid and I’ll find you a black Pope. Cook brings a vertical threat down field. The Rams have struggled finding their version of Rob Gronkowski; Joe Klopfenstein couldn’t catch, Dominique Byrd couldn’t stay awake, and seemingly every other tight end was more proficient at blocking than receiving. Obviously, Cook isn’t in Gronk’s class, but at 6-foot-5, 248 pounds, he ran a 4.49 40-yard dash at the combine. Jeff Fisher drafted him in 2009 as a 3rd round pick. Cook’s presence will keep a safety from doubling up an outside receiver — or stacking the box…oh wait, Steven Jackson is gone. But he will certainly open lanes for Brian Quick and Chris Givens. Between Cook and the ongoing development of Lance Kendricks, Bradford now has two legit options at tight end. As I’ve written before, Bradford has always developed strong chemistry with tight ends. Going back to his Oklahoma days, Bradford found TE Jermaine Gresham 25 times over two seasons. 12 of his 45 career NFL touchdowns went to a tight end. Danny Amendola signed with the New England Patriots replacing Wes Welker who darted for Denver and Peyton Manning. Amendola’s contract is for 5-years and $31 million with $10 million guaranteed. There were earlier reports Amendola was NOT getting the attraction he wanted and a return to the Rams was possible. Obviously Tom Brady wasn’t too pleased losing Welker. It’s funny how the NFL works. William Hayes worked on a 1-year, $900,000 contract a season ago before putting up career numbers. Hayes earned himself a new 3-year deal worth $10.5 million. Hayes is an asset. His size, strength, and speed allow him to play both tackle and defensive end. 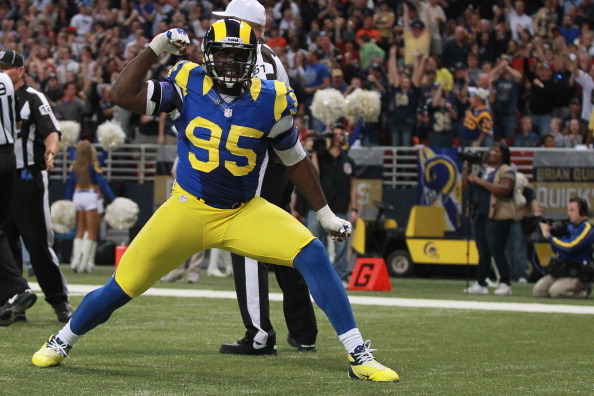 The young defensive line is locked up for years: Chris Long, Robert Quinn, Michael Brockers, Kendall Langford, Eugene Sims, and Hayes. Wow. The Rams had just over $13 million to spend and its quickly running out. Cook counts for $4 million against the cap, and $6.1 million is reserved for rookies’ wages. With Hayes and Jermelle Cudjo signed — the numbers don’t add up for Jake Long and Louis Delmas. Perhaps Sam Bradford could restructure? Rodger Saffold’s agent stated today his client wouldn’t be happy if the Rams landed Jake Long. The signing would force Saffold to move to right tackle, a position that makes considerably less money than left tackle (RH QB blind side). Poor Rodger. He’s under contract and hasn’t distinguished himself as a top player in the league so any barking is rather unnecessary. The Raiders put two intriguing players on the market Wednesay in safety Michael Huff (Texas) and WR Darrius Heyward-Bey (Maryland). Both received massive rookie contracts before the rookie wage scale and simply weren’t worth their pay. However, both players are NFL starters, and could interest St. Louis. For more read this article from Pro Football Focus. Thanks for Reading. Follow @DGrindSports on Twitter. now how black would this pope be?